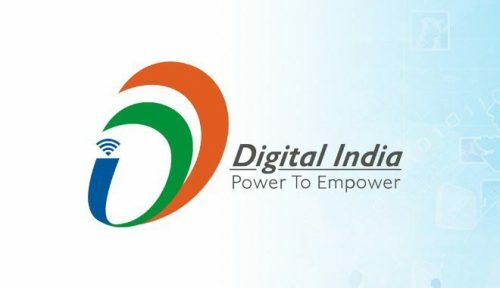 National Digital Literacy Mission (NDLM) initiated with the vision to make at least one person in every family digitally literate with digital literacy skills by 2020. Target is to provide digital literacy to 6 crore rural households. The outlay for this project is Rs.2,351.38 crore to usher in digital literacy in rural India by March,.2019. 2 lakh 50 thousands gram panchayats to be connected with WiFi, Hotspot enabled broadband connection. Lakh candidates, which was achieved in June 2016. The target for Digital SakshartaAbhiyan (DISHA) was 42.50 Lakh Candidates which has been achieved in December 2016. Under Pradhan Mantri Digital SakshartaAbhiyan, target is to make 6 crore adults digitally literate in two years. Nearly 100% of the adult (18+years) population has Aadhaar (as on 31st March, 2018) from 62% (as on 31stMay, 2014). Number of unique bank accounts linked with Aadhaar has increased to 59.15 cr (as on 31st March, 2018) from less than 7 cr (as on 31stMay, 2014). Since September, 2016 58.3 Crore mobile SIM cards have been issued using Aadhaar eKYC. 125 Banks have joined Aadhaar Enabled Payment System (AEPS), leading to an increase in AEPS transactions from just 0.46 Crore on 31st May, 2014 to 141.16 Crore on 31st March, 2018. Aadhaar enrolment trend during March, 2014 to May, 2014 was about 3-4 lakh per day and about 5-6 lakh per day till October 2016. Since Demonetization, the Aadhaar enrolment/ Update requests are in the range of 3-4 lakh per day. More than 1 cr Income Tax Payee have linked their Pan Card with Aadhaar. As on December 2017, around92 lakh CSCsare active and offering digital services like Aadhaar enrolment, Ticket booking, of utilities and other e Governance services to citizens from2.15 Lakh Gram Panchayats, which was only 2.29 Lakh 2016. This has developed digital entrepreneurs among poor, marginalised, Dalits and women of India. More than52,000women are working in these Centres that provide digital services like ticket booking, tele medicines, Jan Aushadhi, Aadhaar service to people. BharatNet Project will enable delivery of high-speed broadband services in over 2.5 lakh villages benefitting more than 200 million rural Indians. As on 6th May 2018, 2,72,690 km Optical Fibre Cable has been laid covering 1,15,461 GPs out of which 1,09,278 GPs have been made Service Ready. Overall Tele-density in the country increased from 75% in Jun 2014 to 94% in Sep 2017. 280 million subscribers added in last three years. Total number of internet subscribers is 445.96 million at the end of Dec-17. Batch 1 auction successfully completed in 2015 after a gap of 9 years. 201 Community Radio Stations operational across India. Launched by Prime Minister Shri Narendra Modi on 26 th May, 2015. सस्ते में घी खाने वाले जान लीजिये कि आप क्या खा रहे हैं ? और कैसे बीमारियों को आमंत्रित कर रहे हैं?